Palomar Systems uses specialized hand-pieces which filter light from different parts of the spectrum. Each band of the spectrum has a wavelength that is ideal for different treatments, such as sunspot removal and vessel clearance. Pulsed light systems and lasers are very similar, but Palomar Pulsed Light Systems use a much larger treatment window than most lasers. This spreads light over a wider area of skin and allows faster coverage of the skin and quicker treatments as a result. Any area, except directly under the eyes. The face, neck, chest, arms, back, and legs can all be treated. Your treatment provider will move the hand-piece over your skin, pulsing it all the while. Each pulse will send a beam of light through your skin. A flashing light, an audible tone, and mild sensation on the skin will tell you when the hand-piece is being pulsed. * Immediately after treatment, you can expect a mild sunburn-like sensation, possibly accompanied by some minor swelling. This usually lasts 2-24 hours, and can be soothed with cold gel or ice packs. 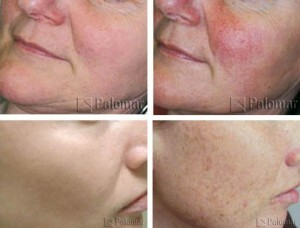 * Typically, several treatments will be necessary to achieve complete clearance of sunspots, rosacea, and vessels.